A bottle of Parker Quink Permanent Blue ink, manufactured in England in the 1970s. One of three I bought this year as a job-lot, after seeing this online. 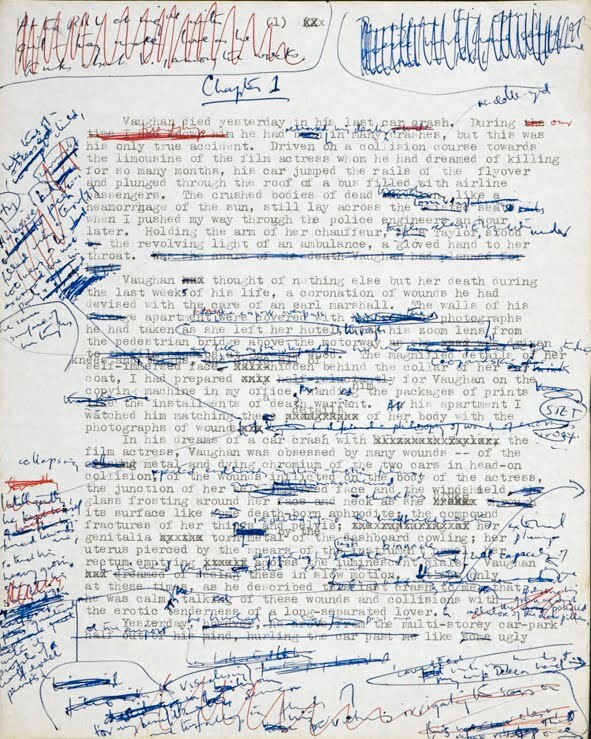 It seems to be the ink used by my favourite author JG B*ll@rd. I've used this recently in the Pilot M90 and it's still good, it dries out to a very respectable darkish blue with no purplue tinge. Don’t expect any impartiality though, because it is about what is probably my favourite pen, the Pilot M90. I bought this pen in the summer of 2009, from a Japanese seller on a well-known internet auction site. I am fascinated by Japanese stationery, paper, pens and pencils; it all seems to be exquisitely designed. In particular I am fascinated by the products of the Pilot Corporation, whose pens are innovative, beautifully designed and well made, even where they are mass-produced such as the V series rollerball pens. I don’t think I have used a Pilot pen which has been anything less than good, and the M90 is more than that: it’s excellent. My route to this pen was circuitous. I started off with a green Pilot 78G which I bought from His Nibs .com. I was impressed enough with that to move on to a black Capless (called the Vanishing Point in the US) which I bought from Cult Pens. I used the Capless as my main pen for over a year and filled it with all sorts of ink, from Pilot’s own black and blue ink in cartridges, to various Diamine and Noodler’s inks. Now it is filled with Noodler’s Bulletproof Black ink and I use it for making notes, particularly astronomical observations as I mentioned before here. I first learned of the M90 whilst looking around the Fountain Pen Network. 2008 was the 90th anniversary of the founding of Pilot, and in keeping with previous significant anniversaries (not to mention custom and practice throughout the pen industry) they issued a limited-edition pen. What I found fascinating about this pen, was that it was not covered in gold or fancy decorations, but instead was a re-interpretation of a Pilot classic, the Myu 701, which is mentioned here. The M90, like the Myu before it, is a pocket pen – a pen which by design has a shortened body and a long cap, and which only achieves operating length when the cap is posted. Before reading about the M90 I had never seen or heard of a pocket pen, but it seemed to me to be a unique solution to the problem of how to carry around a pen without a pen case, which most European pens appear to demand. By habit I carry pens around in my shirt pockets, but I have found that a standard European fountain pen – a Lamy Safari, for example - can sit proud in the pocket and be a bit cumbersome. The M90 sits discreetly in my shirt pocket, ready for deployment to take notes at any time. 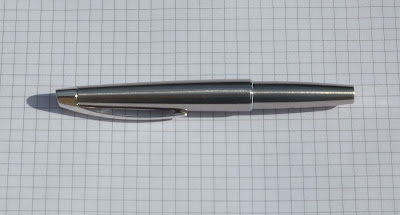 When capped, this pen resembles a small, stainless steel pod. When posted, it transforms into a stainless steel quill. The sleek lines of the pen are spoiled somewhat by the ring which separates the nib unit from the barrel of the pen, but this has not irritated me, unlike some others who have lamented this where the original was more streamlined. Some have complained that this pen is “only” a cartridge pen. The cartridges are Pilot’s own proprietary design; standard “international” cartridges will not fit. Pilot sells a press-bar converter separately, the CON-20, which fits snugly in the space available in the barrel. For over a year I used a Pilot cartridge, filled first with Pilot’s own ink and then refilled using a syringe and other manufacturers’ inks. Having used both the cartridge and the converter, I have to say that I prefer the converter partly because it is less of a hassle to do, and partly because I have less explaining to do if I use the syringe at work, where I do most of my writing. However the downside to using the converter is that the CON-20 does not tell you how much ink remains in the bladder, which in any case holds much less than the 1.1ml capacity of the cartridge. I have had the pen run dry unexpectedly on me on a couple of occasions, usually in meetings where I have forgotten to bring a back-up. I may well switch back to the cart, so I can see how much ink I have left. On the subject of filling systems, I have to say that I cannot bring myself to be very excited by them. It would make no difference to me if the M90 was a piston-filler. To me the essence of a fountain pen is its nib; this is the point of contact with the paper, and the one part which is in use all of the time, unlike the filling system which is used only every few days or weeks. And the nib on the M90 is superb: one of the most striking things I found about the M90, and one of the reasons for buying one, was the integrated nib. Reading around the internet it seemed that this stainless steel nib was very stiff: definitely in the nail class of nibs. I was not bothered by this, and still I do not find it to be a problem, though I have yet to buy a pen with genuine flex, which I know have their fans. I had been a bit wary of the stainless steel, however. I had childhood memories of my father’s stainless steel Parker pens. I’ve never liked the Parker “Flighter” pens much, probably because of the feel of them. They felt rough to me. But I need not have worried. The M90 is finished with great finesse, and brushed with more care and finer buffing than those old 1970s-era Parkers. The clip and the central ring are not brushed, and add a bit of contrast to the rest of the pen. With use, and constant uncapping and posting of the cap, the steel gathers fine scratches. The moral is clear: do not use this pen if you wish to have it looking perfect! But this pen was made to be used. I tolerated the microscratches at first, but now I celebrate them. This is MY pen and these are the scratches I have left on it. More disconcerting for me though was the dent I found on the barrel. How it got there, I still do not know. Even though I take care with my pens, and wrap them in a suede leather pen-wrap I made myself, this dent was still inflicted on my precious. To begin with, I wondered how to have it removed; I posted a question on FPN about it. One of the replies, which said that I should leave the dent and treat it as a battle-scar, made me feel better about the situation. The dent will stay, a reminder that once I was careless with this pen and to take better care in future (which I do). My M90 has a M nib. M90s are available in either F (fine) or M (medium) nibs, though it should be remembered that these are Japanese standard thicknesses, which are finer than European widths. I have found though, that it leaves a line closer to a European M I think, and not as fine as I had been expecting. In a way I regret not buying one with an F nib, because as I use fountain pens, I find that now I favour finer lines to thicker ones. The design has been tweaked a little bit to differentiate it from the Myu, most notably the small blue gemstone mounted in the top of the cap, the engraved M90 logo on the clip, and the design of the ring. In keeping with the blue gemstone, I decided I would only fill my M90 with blue ink, a resolution I have so far mostly kept, although I did once try it with purple ink. I reserve the right to change my mind; at the moment I’ve been using a lot of green ink. I have tried a variety of blue inks in this pen, which caused me a bit of a problem at first because one of the reasons I took up a fountain pen again was the fact that I could change colours easily. I tried to avoid blue ink, in fact. However blue seemed to be the only appropriate colour for this particular pen. The ink I use now is some old Quink Permanent Blue; before that, modern Quink Blue and before that, I used Waterman South Seas Blue. 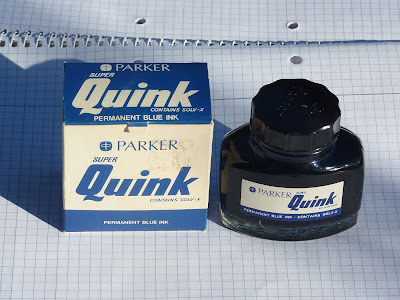 Quink gets short shrift from most fountain pen users but I think that is unfair; to be honest I was a bit sniffy about it myself, because I was more interested in using fine inks from the likes of Noodler’s and Diamine. But having tried some of those inks, I have returned to using Quink. It’s probably something to do with childhood memories of my father using it in his Parker fountain pens, and then using it myself at school. I have always liked that squat bottle. Quink behaves well in the M90, with a slight tendency to run on the dry side. Even though the design is basically a 1970s design, the M90 looks thoroughly modern. This is a pen for people who enjoy modern design and fine writing. Every time I use this pen, even for the most mundane of purposes, my heart is lifted. I really wish that Pilot would produce a version of this pen not as a limited-edition but as a regular model. Years ago, in an earlier job in the civil service, I had a shorthand notebook which was just about perfect. 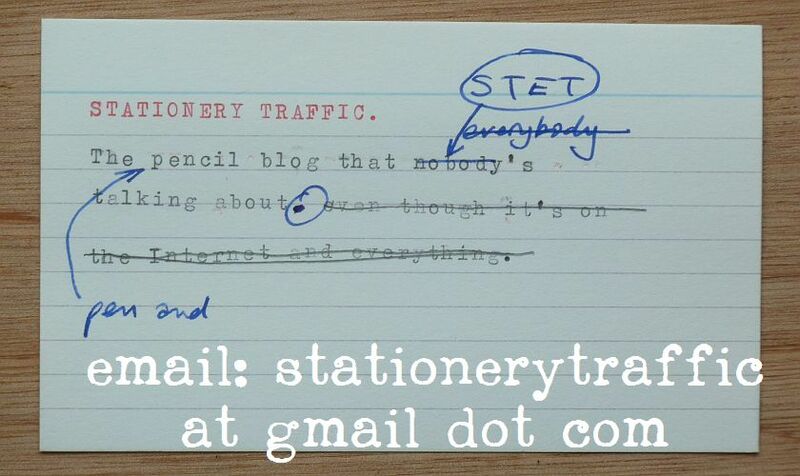 It was made by HMSO (Her Majesty's Stationery Office - now called The Stationery Office after privatisation in 1996). In all senses this was a conventional shorthand notebook: it was wire-bound, and had feint lined paper. But the reason I liked it, was this: it had thick cardboard covers, with a hole cut into each, near the bottom. When the covers were turned inside out, and a 8cm treasury tag attached to brace them, it could be stood up to enable the typist to read what they had written whilst typing the text on a PC. I particularly liked this function, but also the light-blue cardboard front cover. The cardboard used was robust so it could be used anywhere dry and could withstand a battering in the briefcase. Recently, I have been looking around for a similar shorthand notebook but to no avail. Most have the thick cardboard back cover, but the front cover is usually a thin sheet of glossy paper which simply is not robust enough to be used as a stand for anything at all. Even Clairefontaine's version is not up to spec (though the paper is as nice as ever). If anyone could point me in the direction of a shorthand notebook which is similar to that old HMSO notebook, I'd be grateful for the information. I only wish now I'd ordered a few more and created a stash of them.